I have a confession to make. Even though I use Italian seasoning pretty much ALL the time, I never knew exactly what it was made of. I could have guessed thyme, and maybe oregano, but beyond that… I wasn’t really sure. This meant that if I ever started to run low on Italian seasoning, I had to buy more quickly so I wouldn’t risk running out. Silly, right? Well, if you aren’t sure either, today is the day we find out! Not only is this important to know because you want to know what you are eating, but it’s also important because now you can make your own dry Italian seasoning substitute (and even Italian dressing!) yourself for less! No more last-minute trips to the store when you find you’re running low. Now, you can simply grab all of the ingredients from your pantry and make your own! Not only is this Italian seasoning recipe ridiculously easy to make (just measure and stir), but I bet you have most, if not all, of the ingredients on hand right now already. Quick, go check. Do you have, garlic powder, onion powder, oregano, parsley, sugar, pepper, basil, thyme and dried celery leaves? Even if you only have most of these ingredients, you can make your own homemade seasonings. What’s even cooler, however, is the fact that you can also use this Italian seasoning substitute recipe to make your own Italian dressing! Simply combine two tablespoons of the seasoning mix with 1/4 cup vinegar, 2 tablespoons of water and 1/2 to 2/3 cup olive oil. In no time you’ll have your own Italian dressing that is not only good for you, inexpensive and yummy, but also easy too! 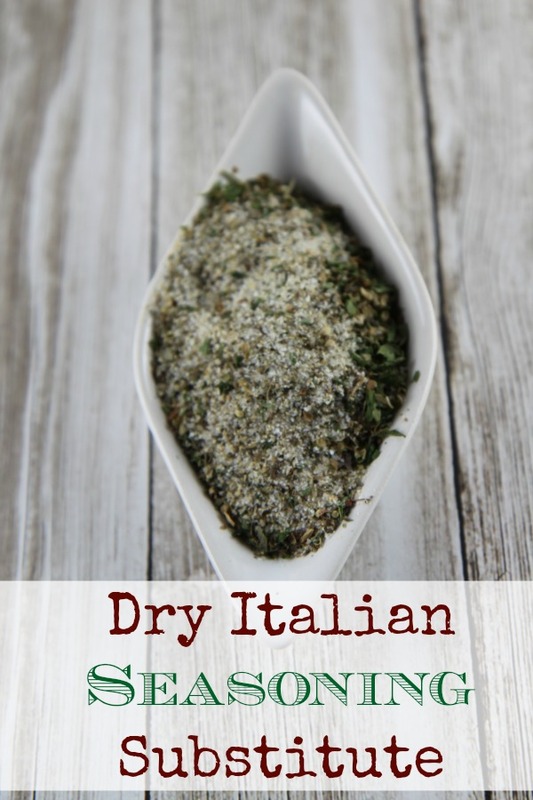 This dry Italian seasoning substitute is one recipe you will definitely want to pin or print so you always have it on hand. Go ahead and do that now before you forget, and then be sure to come back and tell me how you liked the recipe after you try it! ½ teaspoon dried celery leaves. You can use this in place of Zesty Dry Italian Dressing packets. To make dressing: Mix 2 tablespoons of mix with ¼ cup vinegar, 2 Tablespoon water, and ½ to ⅔ cup olive oil. I’m planning on making this seasoning. Do you know how much seasoning you would use to make spaghetti sauce? Thanks.